Is is a stew, or is it a soup? Who knows, but I call it a stoup! The day I made this it ate more like a soup, but the second day, its texture was more like a stew. I’m thinking the barley continues to soak up the liquid and thickens overnight. Either way, it was about time I made this staple cold-weather meal. Sooo comforting! I used the last package of our top sirloin steak from last year’s quarter cow as we began to make room for our new cow in the freezer. Our lucky daughter got to take home about 10 pounds of ground burger to share with her ever-hungry male roommates in college that we never got around to using. (It appears we ate way less burger than we did in prior years.) You can use any cut of beef for this that doesn’t need a super-long cook for tenderness. Season cubed meat with salt and pepper, then toss with some flour to dust it. In a large soup pot or dutch oven, heat olive oil over medium-high heat. 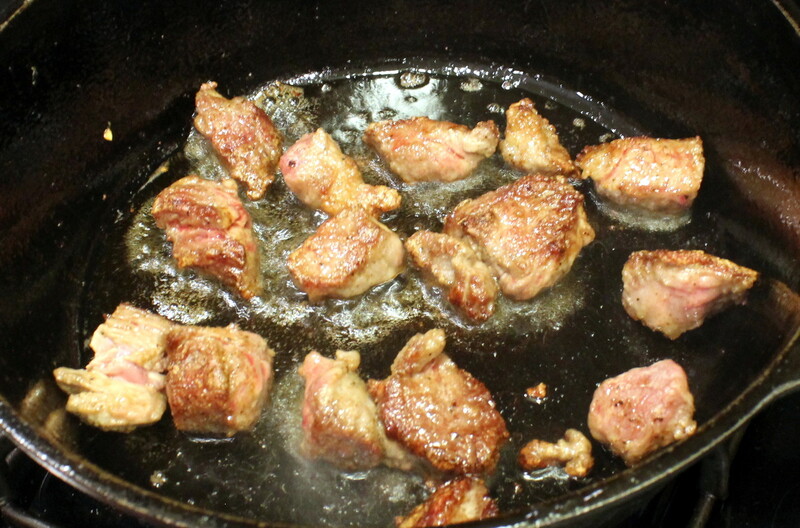 Add beef to pot, and sear cubes on all sides until browned. Remove to a bowl and set aside. 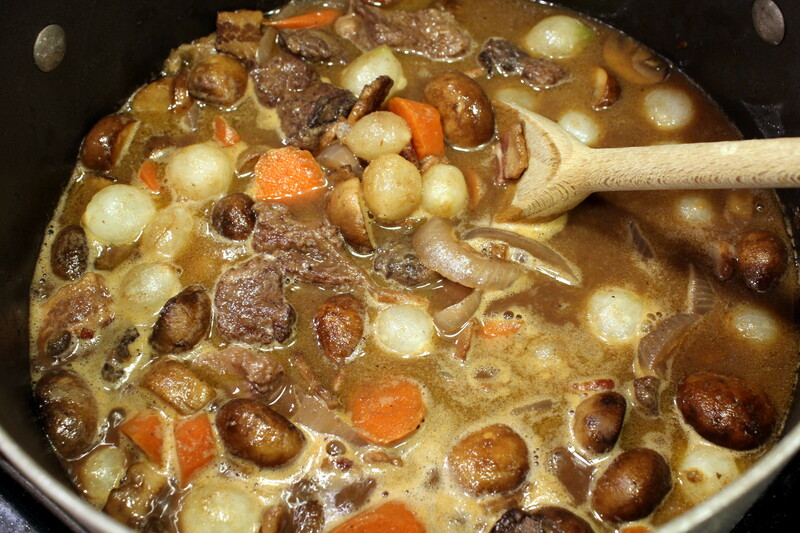 Add onion, carrots, celery, and mushrooms and cook about 8 to 10 minutes, until mushrooms start to brown. Add the minced garlic and tomato paste in the last minute of cooking. 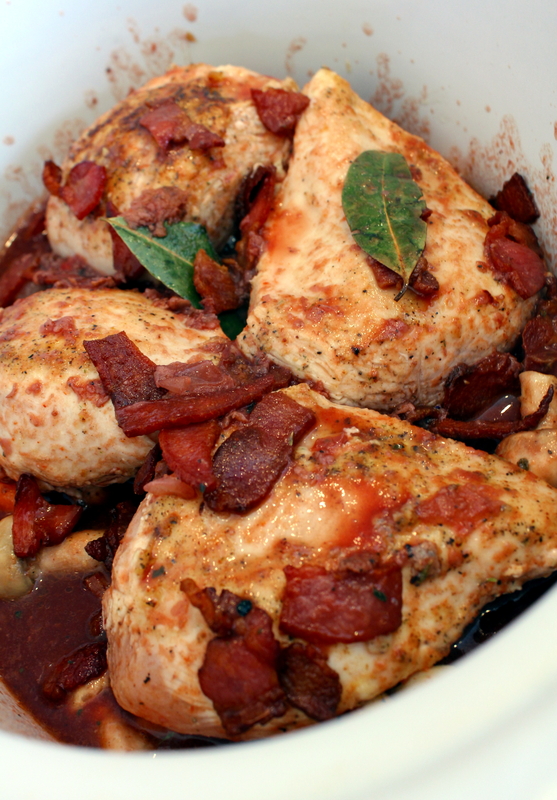 Pour in the red wine and deglaze the pot, scraping up the browned bits. 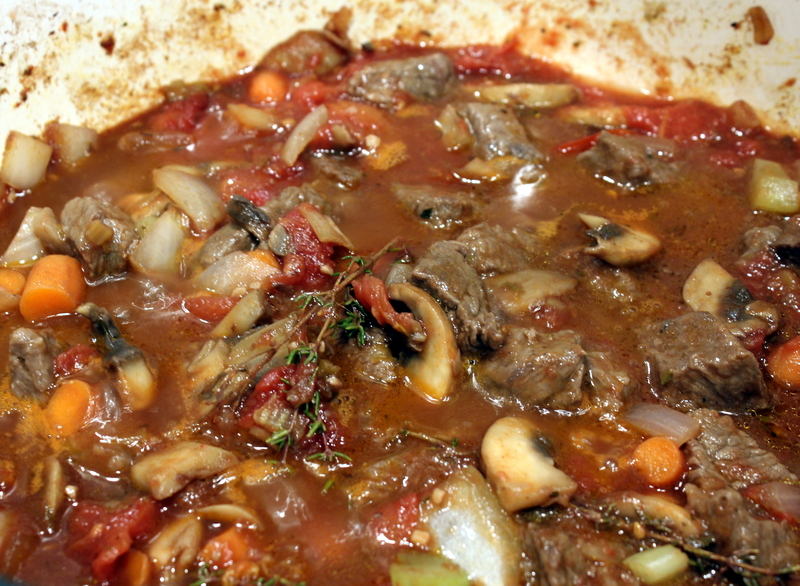 Add the stewed tomatoes, beef broth, bay leaf and thyme sprigs. Stir well to combine. Add the meat, including any accumulated juices in the bowl. Bring to a boil, then stir in the barley. 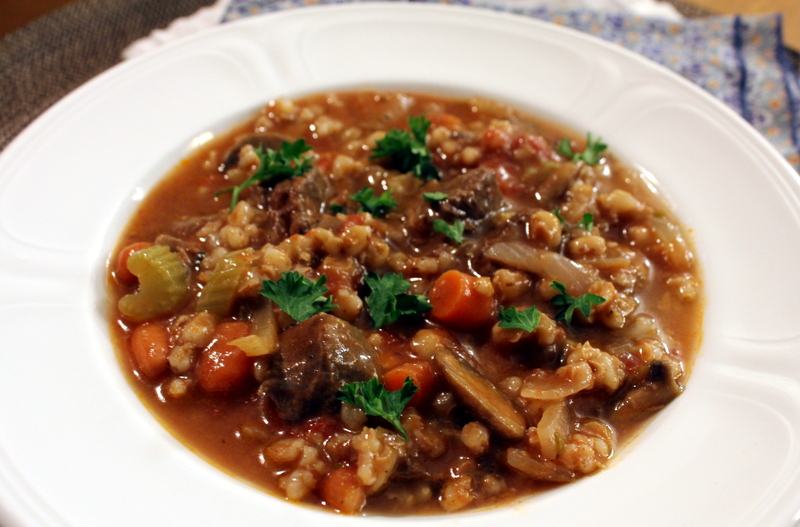 Reduce heat, cover and simmer, for about 45-60 minutes or until the barley is cooked. Remove bay leaf and thyme sprigs and taste for additional salt and pepper. Serve in bowls with crusty bread for dipping/sopping. p.s. Tomorrow starts my seventh year of blogging, can you believe it?? Thanks for hanging with me! And please have a safe and Happy New Year! I know this beef man from Ireland, and Conor Bofin is his name. He’s the closest I know to a connoisseur of any part of the damned cow that I know, even the unusual and sketchy bits. But he can cook the most amazing meals with that lowly bovine, so I jumped on the chance to sort-of copy-cat this wonderful braise of beef shanks with some nice meaty ones from our quarter cow. Preheat oven to 325 degrees. Season the beef shanks with pepper and salt, then score the membrane in several places on the sides. Heat a Dutch oven to medium high heat and add the oil, then sear the beef until very browned on all sides. Remove and set aside to a plate. Add the butter, then toss in the onions and mushrooms. Reduce heat a bit. 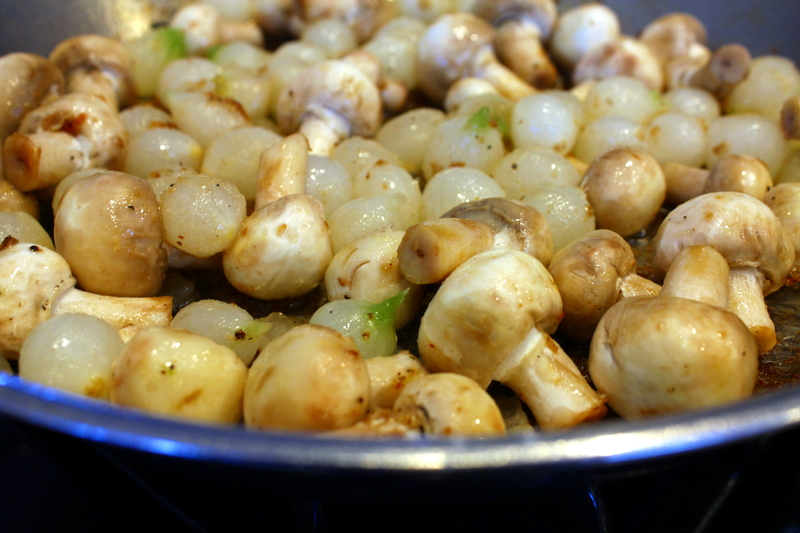 Cook and stir until the mushrooms have browned and onions are softened. 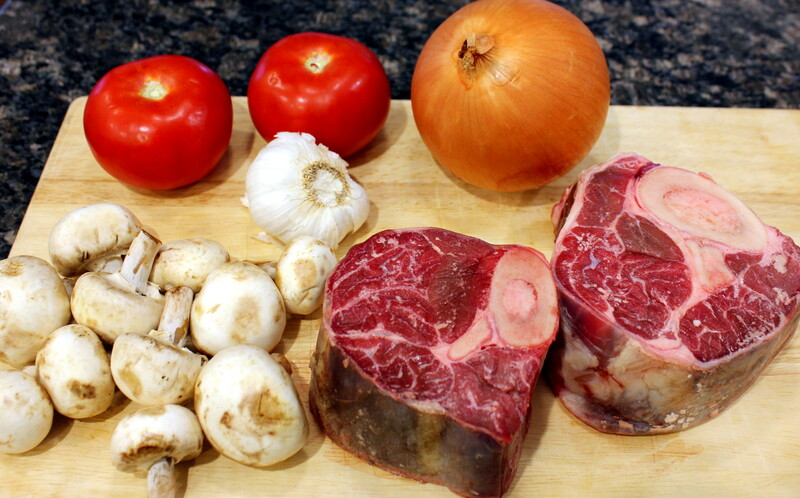 Top with the tomatoes and garlic, then pour in the beef stock. Grind more pepper over if your feeling it. Stir in the tomato paste until combined. Now pour in the red wine and bring up a a boil and simmer for about 5 minutes. 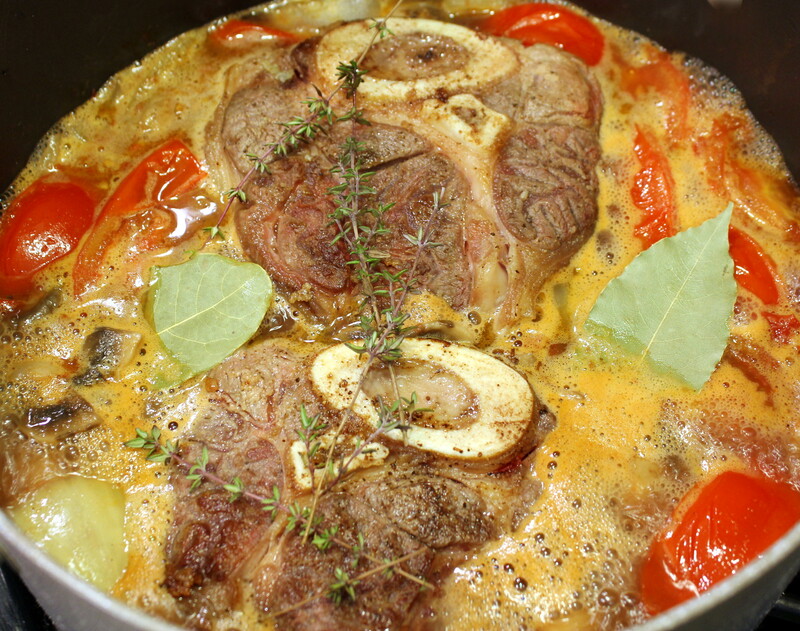 Nestle the beef shanks into the liquid, then add in the bay leaves and thyme. Braise Ready for Oven ~ Time to read a book now. I did. Really. Cover and cook in the oven for 4 to 5 hours, until beef is fall-apart tender. Remove the beef to a plate, then remove the bay leaves and thyme sprigs and gently stir gravy to combine. Taste for additional seasonings and add, if needed. 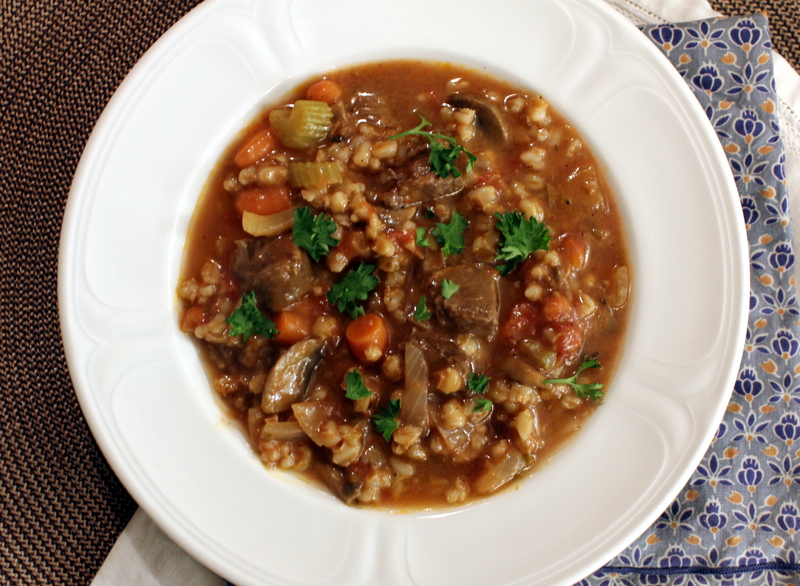 Serve each shank with risotto, pasta, or potatoes, topping the shanks with a generous amount of gravy and veggies. I say “sorta” because I only cooked about half the ingredients via the sous vide method, as I was concerned my gallon zip-lock baggie would not hold it all. 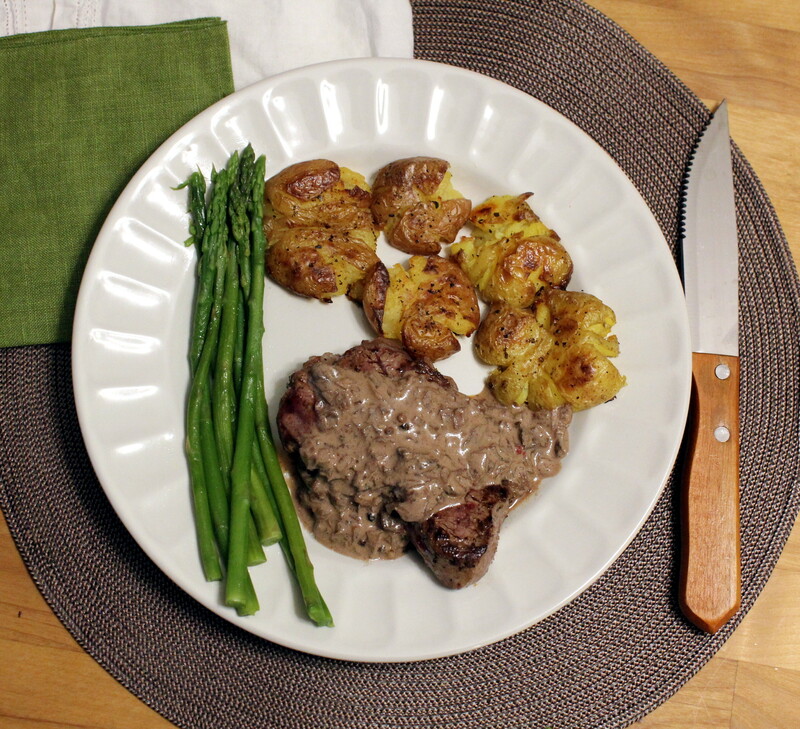 This also turned out to be an accidental birthday dinner for my husband, as when I started the process 24-hours earlier it hadn’t dawned on me I’d be serving it the night before his birthday. Don’t have a sous vide machine? No worries, you can make this on the stove top in a Dutch oven. Simply cover and simmer for about 2 1/2 hours until beef is tender. 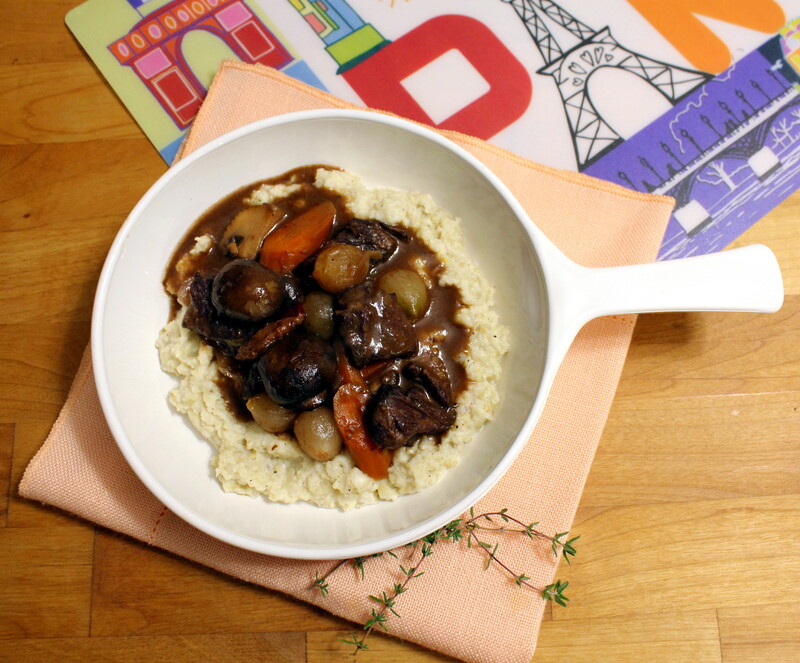 This made an elegant dinner, with beautiful rich flavors and fork-tender beef. 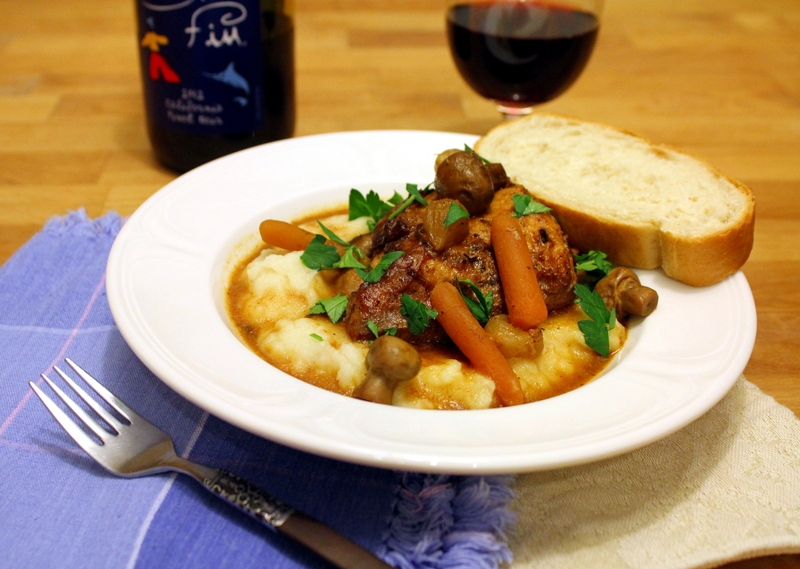 I served this over a cauliflower puree, but it can also be served over mashed potatoes or noodles. Set your sous vide in a large pot of water to 149 degrees F (65 C). 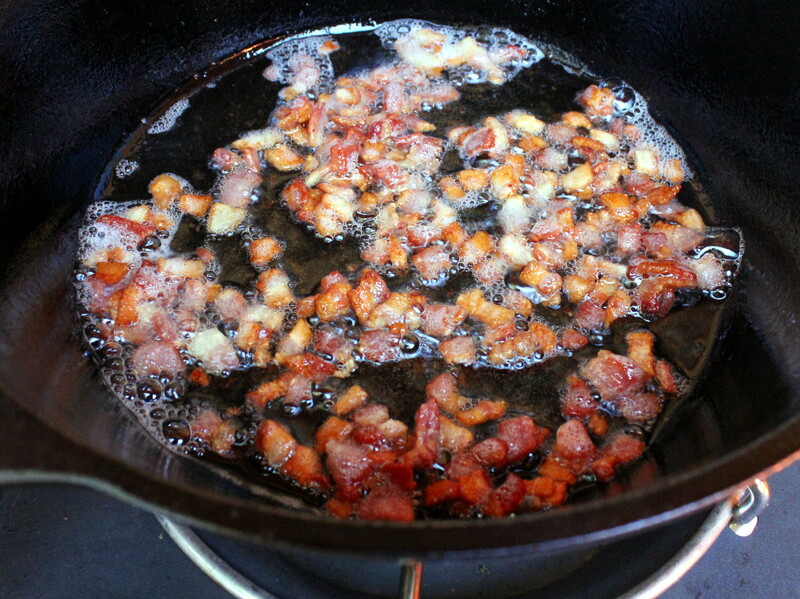 Cut the bacon into lardons and cook in the oil in a Dutch oven or deep cast iron skillet over medium heat until crispy. Remove bacon to paper towels to cool. Reserve one tablespoon of grease and refrigerate it. 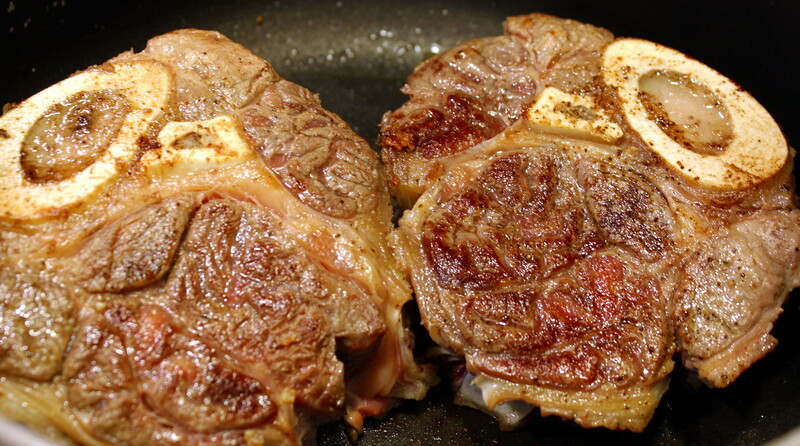 Dry the beef with paper towels and season with salt and pepper and toss with 2 tablespoons of flour to coat. In the same pot with the remaining hot bacon grease, cook the beef in batches until browned on all sides. 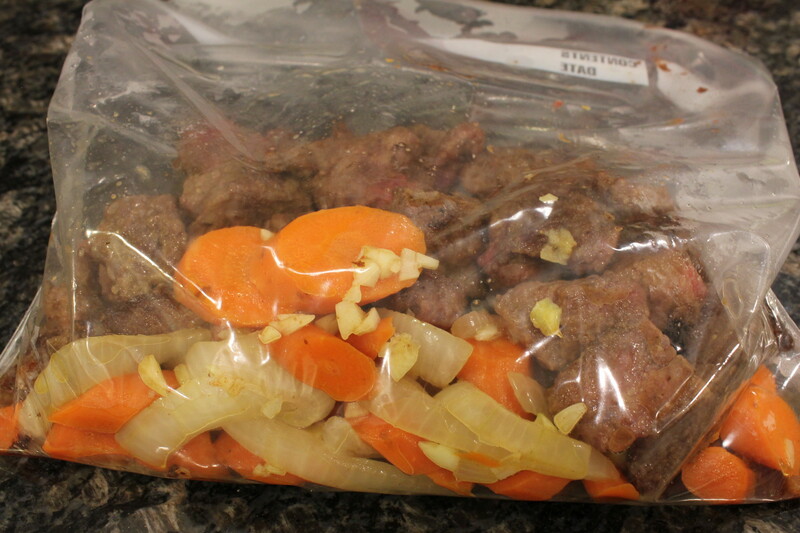 Add the beef and bacon to a 1-gallon zip-lock bag. Peel the carrots and cut into cross-wise slices and slice the thick onion slices in half. Cook in the remaining oil in the pot (add more if needed) for about 10 minutes, then add the minced garlic and cook for about a minute more. Add the vegetables to the bag. Deglaze the pot with the red wine, scraping up any browned bits with a wooden spoon. 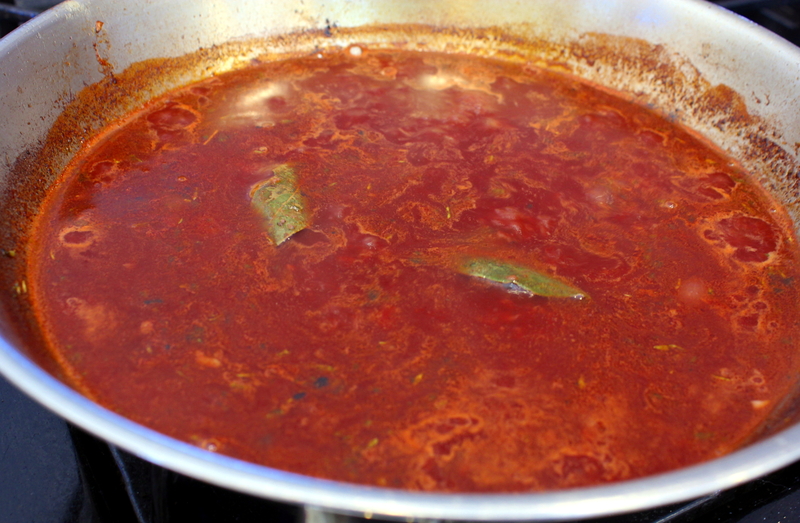 Add the beef broth and tomato paste, stir to combine, then reduce heat and simmer until reduced a quarter in volume, about 15 minutes. Add the wine mixture, the thyme sprigs, and bay leaf to the bag. Seal using the water immersion technique, add to the sous vide pot and clip it to the side. Cover the water bath with plastic wrap to prevent evaporation. Sous vide for 24 hours. After 24 hours, melt 2 tablespoons of butter plus the one tablespoon of reserved bacon grease to a Dutch oven. Saute the mushrooms until starting to brown, about 5 minutes. Add the thawed pearl onions and cook for an additional five minutes. Remove from pan and set aside. Melt two or more tablespoons of butter and add 2 tablespoons flour and whisk until it forms a paste. 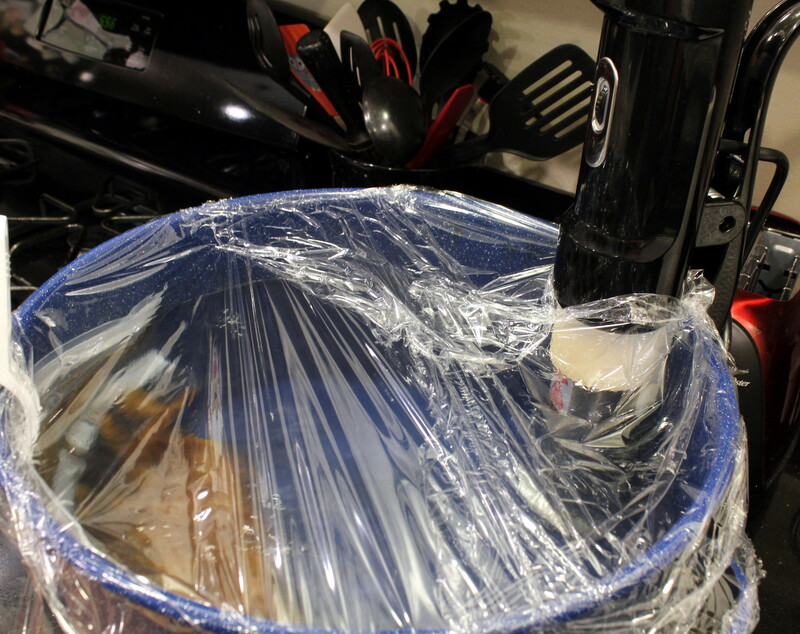 Remove bag from sous vide pot and carefully pour the liquid from the bag into the pot. Bring the sauce to a simmer, whisking constantly until sauce is thickened. 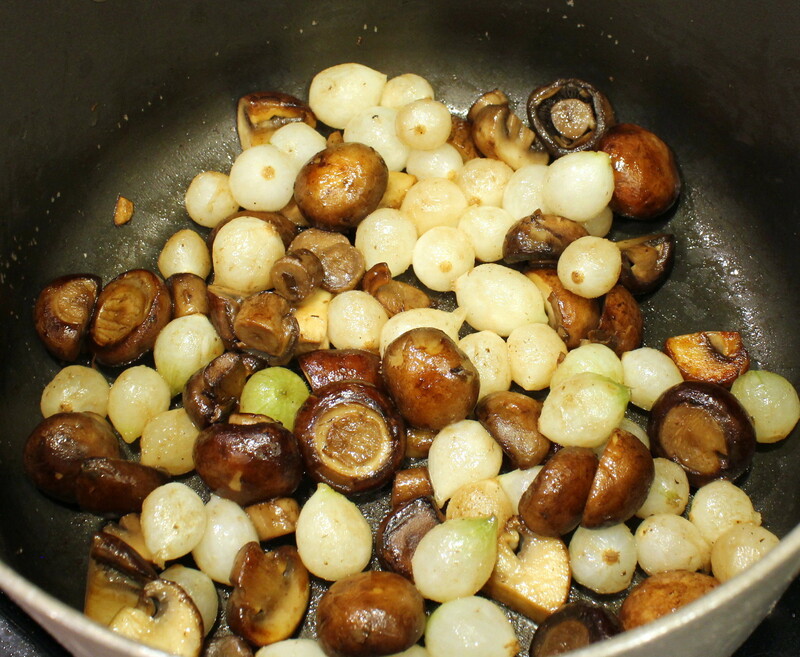 Add the mushrooms and onions and the rest of the contents of the bag to the pot and stir to combine. Remove thyme sprigs and bay leaf. Serve over cauliflower puree, mashed potatoes, or noodles. Bon Appétit! Once again I am dashing off to another trip to the coast, this time to our RV river property for four days. I made this a couple of weeks ago, with HUGE THANKS to Conor Bofin of the delightfully funny and delicious food blog, One Man’s Meat. I take zero credit for this recipe. In fact I copied his recipe so exactly (other than having a more inferior steak and wine than his) that I will simply link you directly to his site for it. The pictures are my own on this page, but his photos are a feast for the eyes! I served this with my Smashed Roasted Little Potatoes and asparagus. PLEASE do hop over to his site and read his witty writing, delightful photography, and mouth-watering recipes. This particular recipe is not only drool-worthy, but worth a good chuckle. You won’t be disappointed! Even if you don’t eat meat, his way with words will be sure to delight you. DO read the photo captions too. They are particularly clever. Enjoy! Those were pretty much the first words out of hubby’s mouth after finishing the meal. I must admit this is pretty damned good, too. In my usual frugal manner, I had picked up some super-thin cut pork loins in the 50% off bin and was randomly searching the interwebz and Pinterest what to make with them and Voila! Not only did bacon and mushroom gravy catch my eye, but so did the unusual name. Jager (properly spelled Jäger in German) loosely means hunter, named after the German military term for rifle-armed infantry. 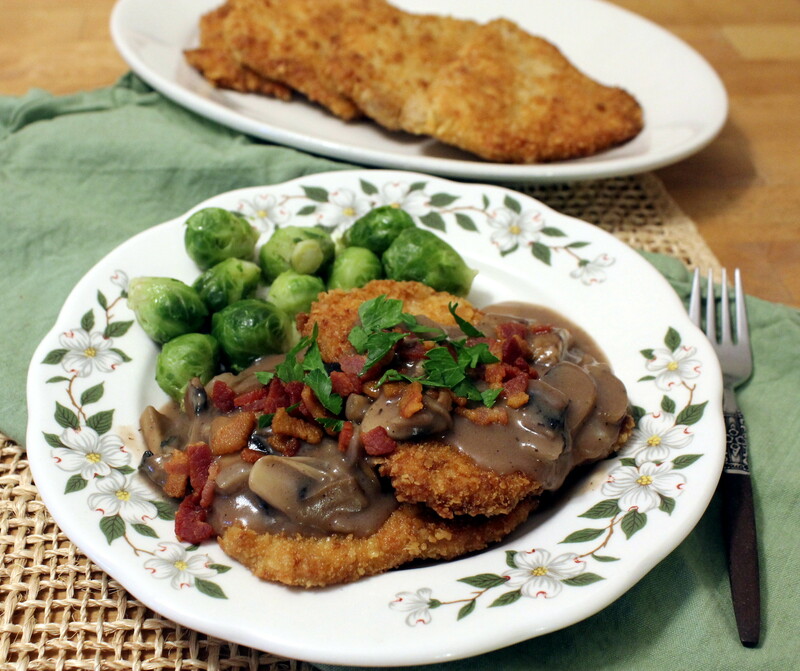 In short, “hunter’s cutlet” and the dish was originally made with thinly pounded venison or wild boar backstrap. In the U.S., it is typically made with pork. 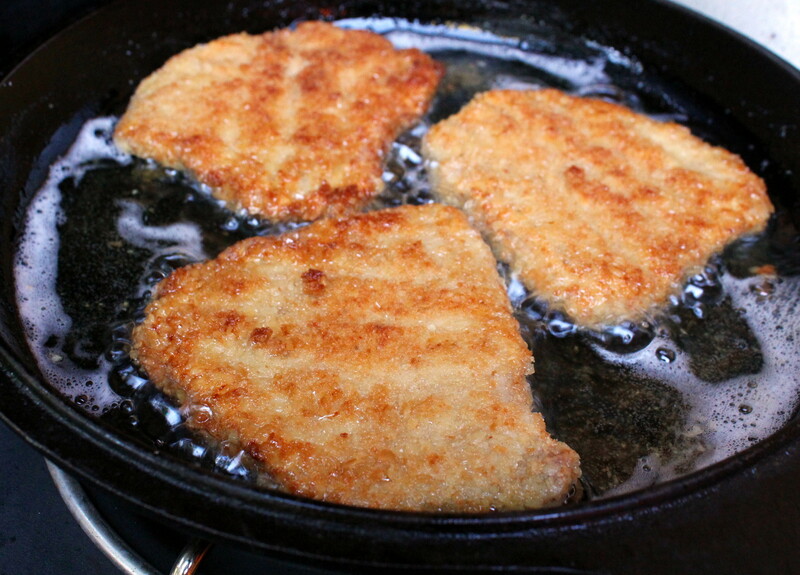 If you do not pour sauce over all the cutlets, then the schnitzels reheat beautifully with a light spray of oil in the toaster oven. The meal is typically served with spaetzle or noodles, but I served Brussels sprouts instead. Hey, that’s close to Germany! This isn’t the quickest dinner to make in the book, but it is so very worth the time. It took me about an hour and a half but if you have all your ducks in a row (i.e. prep everything ahead of time) then you could probably make it in an hour. Guten Appetit! If your pork slices are not already thin, pound them thin until 1/8 to 1/4 inch thick. Trim the fat off the pork edges. On a plate, mix together 1/2 cup flour with salt, pepper, garlic and paprika. In a bowl, combine egg, milk and mustard. On another plate, combine crushed crackers and panko. 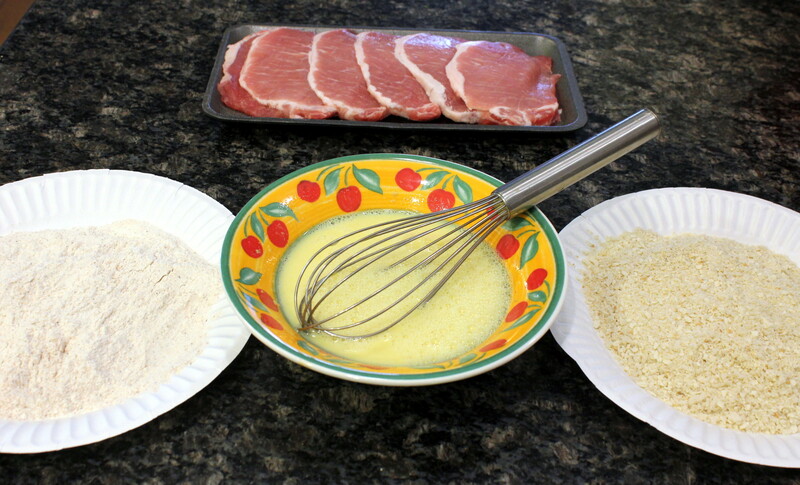 Dredge pork slices first in flour, then in egg wash, then in the crumbs. Set on a cooling rack above a sheet pan and place in the refrigerator until ready to cook. In a cast iron skillet (or other heavy pan), cook the bacon until crispy. Remove and drain on paper towels. Frying Bacon ~ And yes I did cook this entire meal on our grill propane burner outdoors! In the same skillet with the bacon grease, add the onions and saute for several minutes. 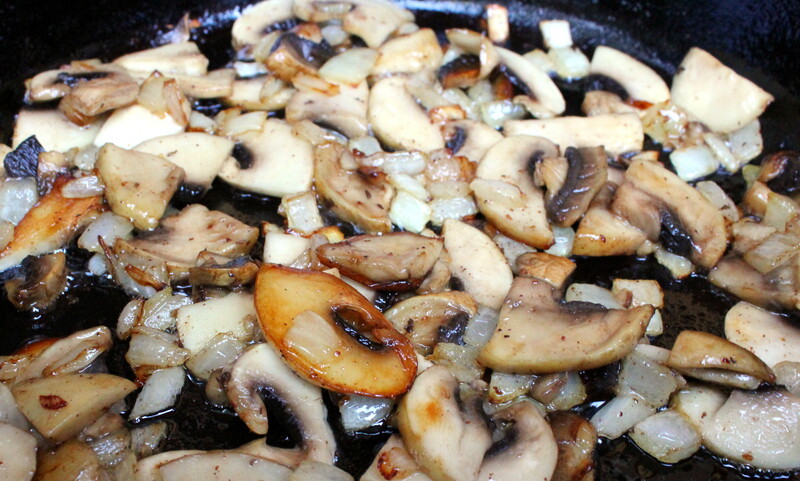 Add mushrooms and continue cooking for about five more minutes until the mushrooms have browned. 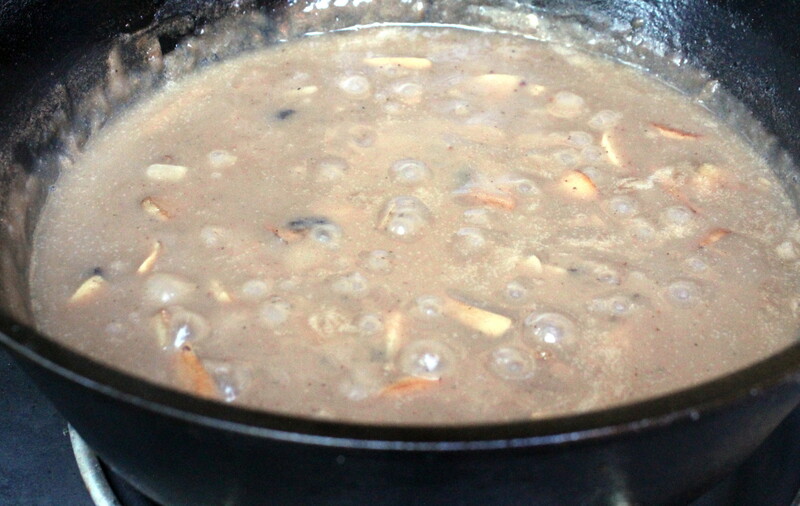 Stir in 1/4 cup flour and continue stirring until you have a light brown roux. Add the wine and cook for a few more minutes until it’s reduced by 1/3, then add the beef stock. Continue cooking to reduce by 1/3 again. Season with salt and pepper then keep warm on low. Heat 1/4-inch oil in another cast iron skillet (or heavy pan) until it bubbles when you insert a wooden chopstick to the bottom. In batches, cook pork evenly on both sides, about five minutes for the first side, several more minutes for the second. 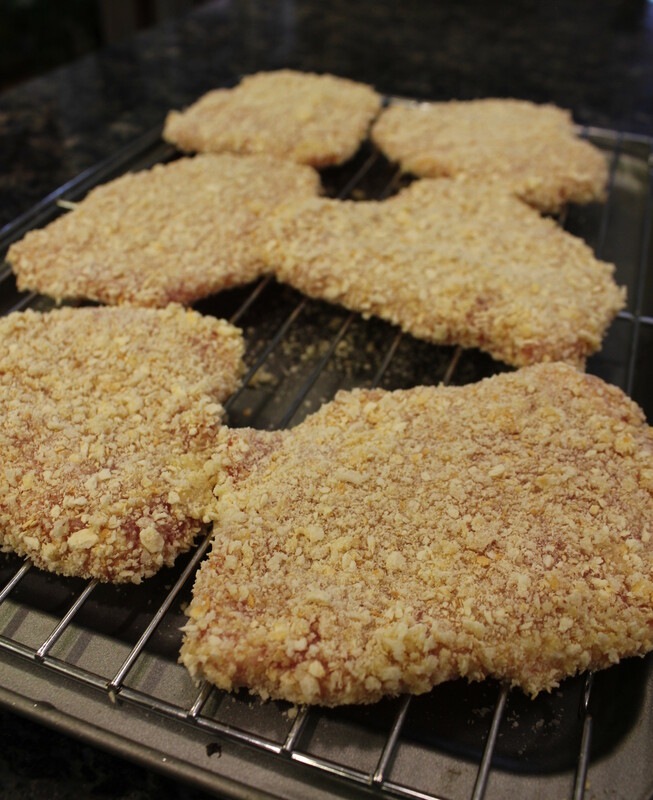 Remove to a platter and continue cooking until all cutlets are done. Add butter to sauce, stirring until it has melted. To serve, cover pork with sauce and garnish with chopped bacon and fresh parsley. How on earth does my mind come up with something like this? Just out of the blue! I guess I’m just getting used to “making do” with what I have in the house as I loathe shopping of any kind. Just ask my family. I really do hate shopping. But what I do really like is coming up with some crazy idea for dinner and think yeah, the family will like this. But then when the family not only likes it, they LOVE it, I’m pretty darned happy. Even before this was finished cooking, my hubby said, “You know we can always order pizza if it isn’t good.” See, he DID have his doubts! Oh shoot, a back story to the salted steak first. (Many of my long-term readers know hubby is on a low-salt diet.) And a video, but you don’t have to watch it. And I also happened to watch it with hubby a few days before I made this. THEN (even with a little less now than a quarter cow in the freezer) I picked up some thin-sliced eye of round from the 50% off bin. I am a sucker for meat deals. Of course I froze it immediately. When I told hubby I brought home some store-bought beef and that it was a very tough cut, he actually got excited instead of rolling his eyes. He wanted us to test out this meat tenderizing trick. If you have a tough cut of beef, follow the method in the video. But if you don’t want to watch it, basically add some course sea salt to the top of the steak and let it sit on the counter for 1 hour for every inch. This steak was so thin we did less than 10 minutes. But even in that short time I could see the steak sweating out and breaking up the fibers! Then you rinse the steak thoroughly of the salt. Pat dry and set aside ready for the stuffing. But meanwhile you can make the steak glaze. Add a splash of oil to a saucepan or skillet over medium heat and cook garlic until fragrant, just a minute or so. Add the rest of the glaze ingredients and cook and stir until reduced by about half. Remove rosemary sprig if not using dried. Take off heat and set aside. Next, take your thawed and squeezed-dry spinach (you did that already, right?) and add to a bowl along with the Feta cheese, red pepper flakes, and lemon juice and mix until thoroughly combined. Brush the steak slices with the glaze with a pastry brush, (if you used dried rosemary, don’t worry as it just gets stuck in the brush anyways). Grind a bunch of black pepper over the steaks. Top the steak slices evenly with the spinach mixture. Roll up and secure with twine or toothpicks. I found twine to be convenient since I wasn’t grilling. Brush any remaining steak glaze you have over the rollups. Grind more black pepper over them again, to taste. I am kind of a ground black pepper freak. Heat a large cast iron or heavy bottom skillet over very high heat with two teaspoons of neutral high-heat oil. With tongs, add the rollups (in batches if needed) to the skillet and cook on all sides until browned. Just a minute or two on each side, rolling often. Remove to a plate and serve with a side vegetable of choice. I chose steamed asparagus. I suppose some kind of bread could be in order but I’m trying to lose weight. 🙂 Happy dining! We cleaned out our indoor freezer last weekend, and lo and behold we found a package of meaty soup bones from our 2014 cow. Not to be wasteful, I knew I had to cook those babies low and slow, to extract all the flavor from the bones and preserve any shred of tasty beef hiding amongst the gristle and bone. Yep, I can do this! I had President’s Day off work, and knew I’d be a happy camper just spending the day putzing around the kitchen and cooking, all thoughts of laundry and house chores away from my mind — already completed over the weekend. This was also a good chance to use up some dried Porcini mushrooms that had been languishing in my bin of assorted bulk spices and what-nots. I looked at the package, fearing they were long expired. Apparently dried mushrooms last a LONG time, as the expiration date was more than a year in the future! Combined with some also-languishing Cremini mushrooms in the fridge, I knew I had the base for a slow-cooked braised ragu. Combine that with some good-quality tomatoes and hearty Pappardelle pasta, and voila! Ragu is served. With lots of fresh-grated Parmesan cheese, of course. Place dried Porcini mushrooms in a glass bowl (I used a Pyrex measuring cup) and pour about a cup of boiling water over them. Top with a folded paper towel to keep mushrooms submerged. (I learned that cool tip from the package of mushrooms!) Allow them to rehydrate for about 20 minutes. 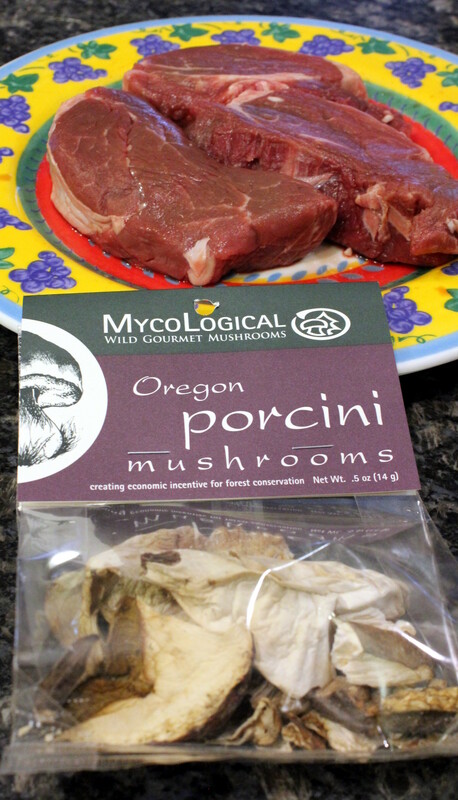 Discard paper towel and remove mushrooms, squeezing out the liquid from them. Strain the mushroom stock through a coffee filter into another cup. Set mushrooms and liquid aside. 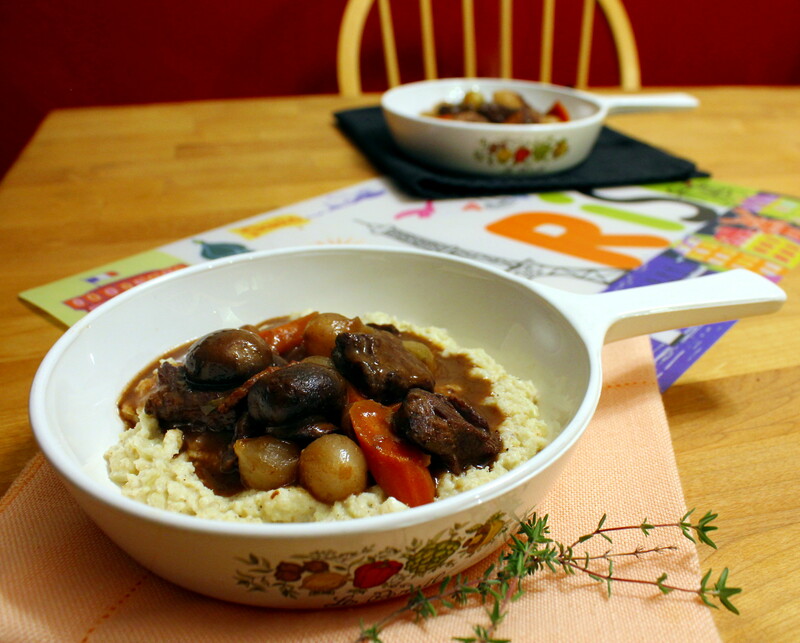 Place a Dutch oven or other pot with an oven-proof lid on stove over medium high heat. Season the soup bones liberally with ground pepper and some salt, to taste. Dredge soup bones through the flour, patting flour in to coat. Add oil and the bones to the pot, browning on each side for about 4 minutes. Don’t forget the sides! Turn off heat, remove bones and set aside. 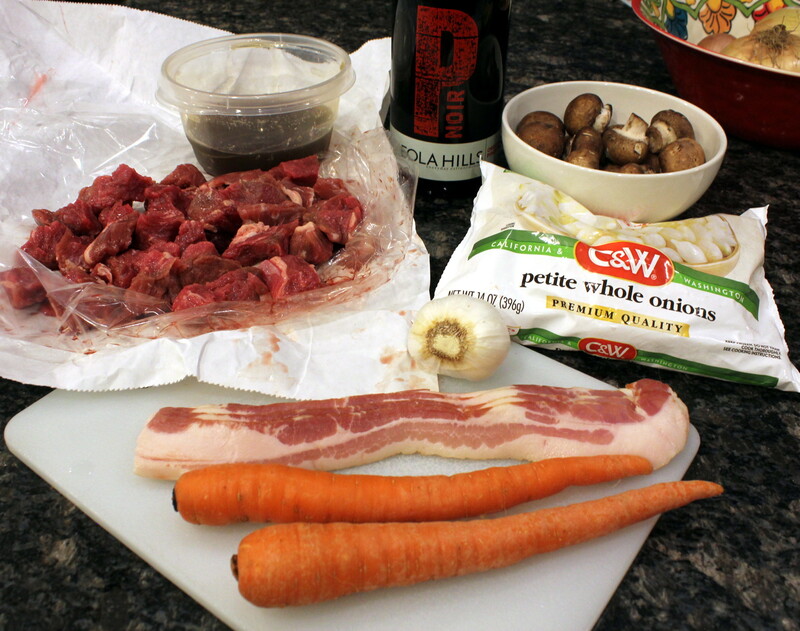 Add the onion, carrots, celery, and bacon to a food processor (you can also mince these by hand). Pulse until finely chopped. Next, finely chop the Porcini and Cremini mushrooms. Turn heat back on under the pot, and check for amount of oil. Add additional if needed, you’ll want about a tablespoon. 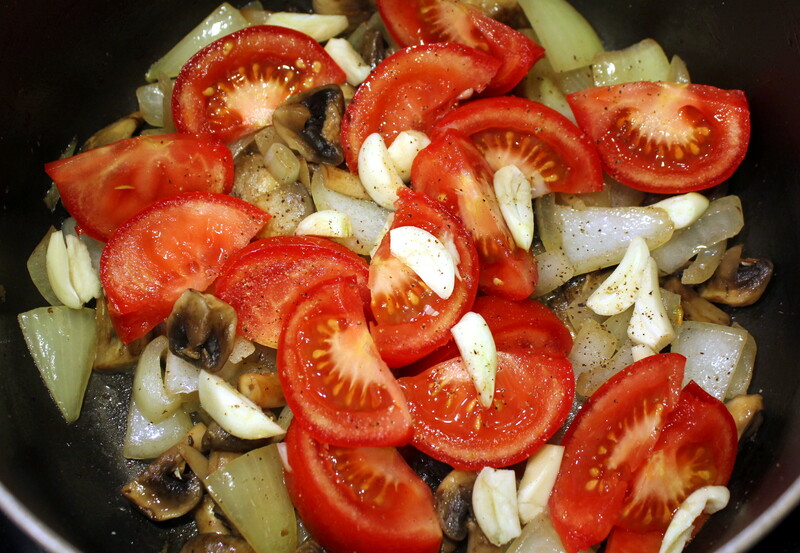 Add the vegetable mixture, mushrooms, and cayenne pepper and cook for about 5 to 7 minutes, until softened. In the last minute or so, add the garlic and cook until fragrant. Next, stir in the tomato paste and 1/2 cup wine, mixing until completely combined. Stir and cook until the wine is reduced by half, about 5 minutes. Pour in the reserved mushroom stock and about a half cup of the beef stock. Add the can of peeled tomatoes, crushing them with your hands as you add them. Also pour in the liquid from the can. Stir until combined, then submerge the soup bones into the sauce. Bring up to a simmer, toss in the three sprigs of thyme and cover tightly. Place in preheated oven. 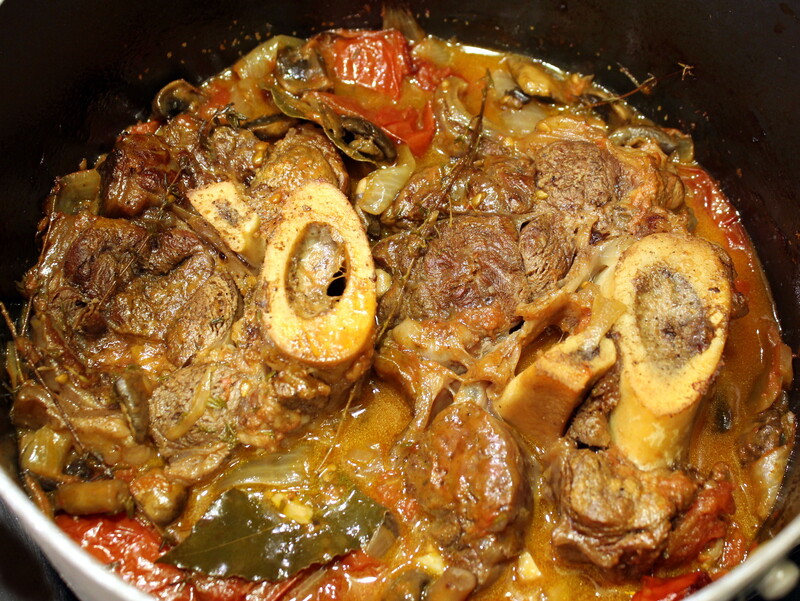 Cook for three hours, or until meat is tender and falling off the bones. Once tender, remove pot from oven. 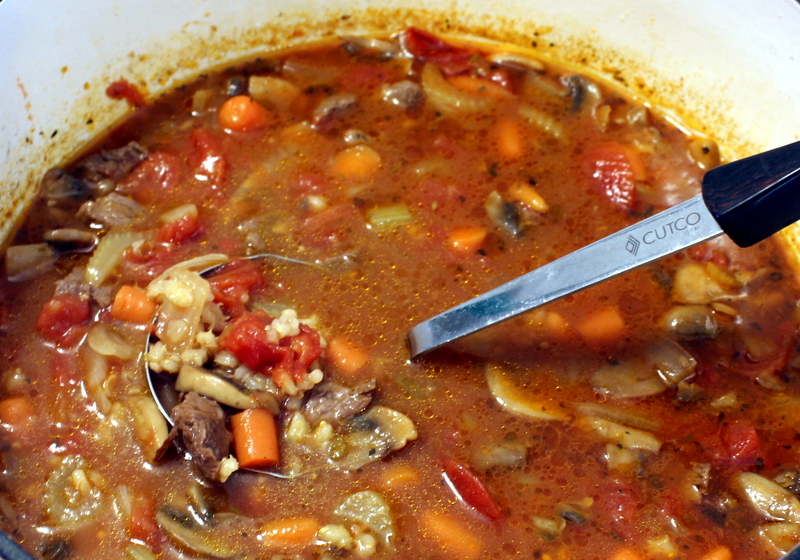 Remove soup bones to a plate and let cool for about 10 minutes or safe enough to handle. The sauce will have thickened by this time. Stir in up to another cup of beef broth and red wine and bring up to a slow simmer on the stove. Meanwhile, cook the Pappardelle pasta according to package directions. Reserve some of the pasta water before draining. 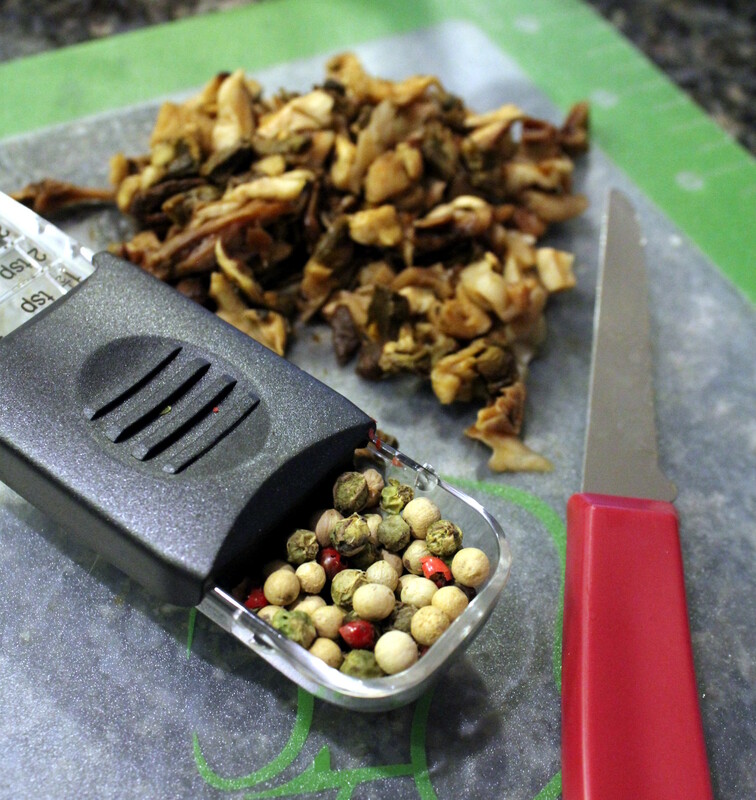 Once the beef is cool enough to handle, shred it with your fingers, discarding any gristle/cartilage. Return the shredded beef to the sauce and stir in the chopped parsley. Pour in a small amount of pasta water to further loosen up the sauce. Taste sauce and adjust seasonings, if needed. Plate the cooked and drained pasta on a platter, then pour the ragu sauce over top. Grate a generous amount of Parmesan cheese over top and sprinkle with additional chopped parsley. Serve on plates or in bowls. 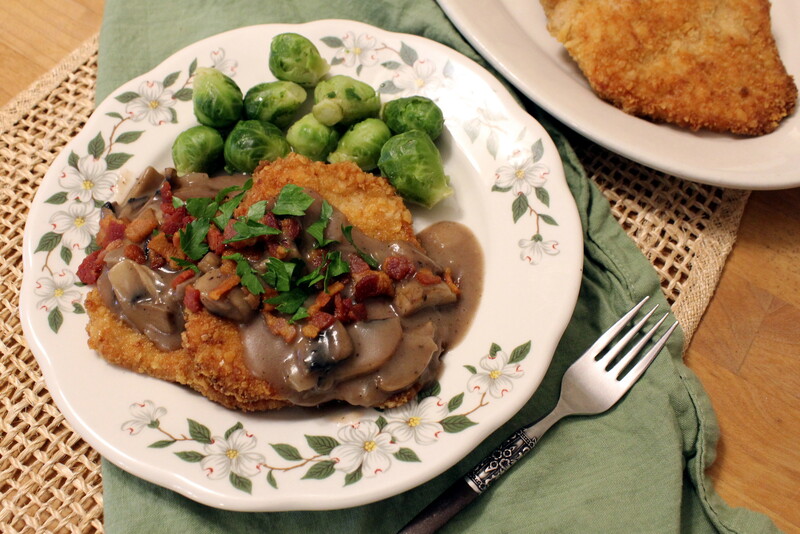 I recently joined in with a group of fun foodie blogger to participate in a recipe challenge. Lina over at Lin’s Recipes “challenged” us to choose from a list of exotic recipes from around the world we had never made before so that we could all expand our food horizon’s beyond our own country. I read through the list then sheepishly asked if I could use a post from a couple of years ago, because hey, at that time it WAS new to me! She graciously agreed. Thank you Lina! Head on over to the Rare Recipe Challenge to see what others have made! The cooks have a week to add their entry, so check back often to see new recipes added throughout the week. Thank you Lina for creating this fun challenge for the month of January (new year, new recipes! ), and a great big thanks to Jhuls for judging the entries. She can be found over at thenotsocreativecook.wordpress.com . 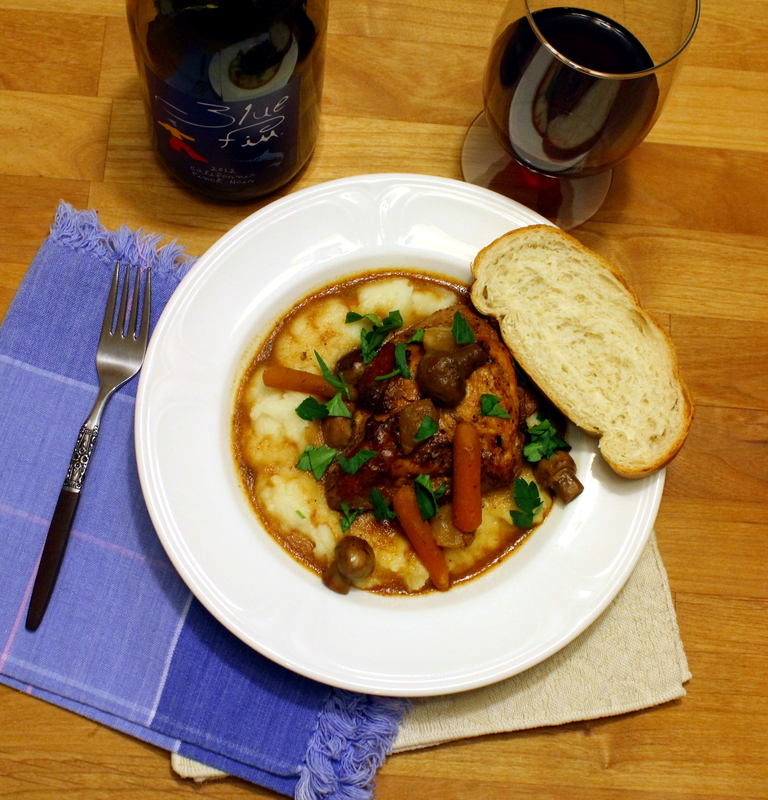 So without further adieu, I bring to you my story of cooking the French dish Coq au Vin! “Ohhhh, yes, yes. It’s Coh ah Vah,” she replied. There is barely a hint of the k and n sound, but I could not seem to quite get that part right and we had a few giggles at my poor attempts. So after I thoroughly corrupted the French pronunciation, I was hoping I didn’t do the same to the meal. For one, I couldn’t find a true Burgundy wine at the store, so settled on a Pinot Noir. I also knew my daughter wouldn’t eat the mushrooms in it, so added some baby carrots. I did, however, ask Caroline what the French typically served the dish over — potatoes or noodles? She said potatoes, so then I asked her if they were boiled or mashed? Another puzzled look from her then had me pantomiming round circles for boiled and banging my fist on the table to simulate mashing. Ahh, the second one, mashed potatoes! After her bowl was filled twice and mopped dry with thick slices of French bread, I can say that the meal was a success! This dish is typically made with skin-on chicken thighs and legs, but all I had were large, boneless, skinless chicken breasts. So I lopped them in half, and hoped they wouldn’t come out too dry. I think using a slow cooker helped retain some of the juiciness but I think next time I would cook them only about 3 hours on high instead of 4 hours. But I was very satisfied with the results, and now I know how to properly pronounce this lovely meal even if I can’t actually say it right. Cook the bacon in a large skillet, remove from heat, and drain bacon on paper towels. Leave about 2 tablespoons of the bacon grease in the skillet, or if you used lean bacon then add some vegetable oil to make up for it. Season the chicken with pepper and Mrs. Dash or salt, to taste. 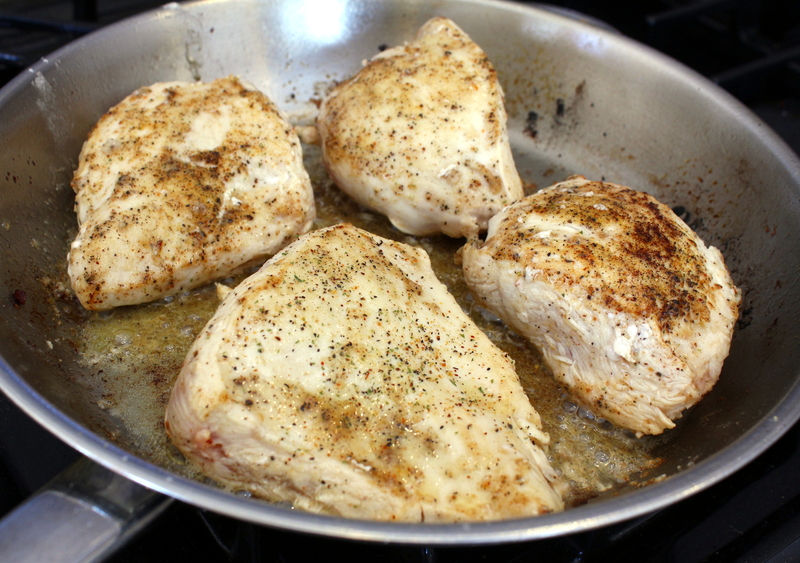 Dust the chicken pieces with 1/8 cup flour, reserving the rest, and add the chicken to the skillet over medium high heat. Brown the chicken for several minutes on each side. Remove and set aside on a plate. Add the tablespoon of oil to the skillet over medium heat, stir in the rest of the flour, then add in the pearl onions and mushrooms. Cook for about 5 minutes, stirring constantly. 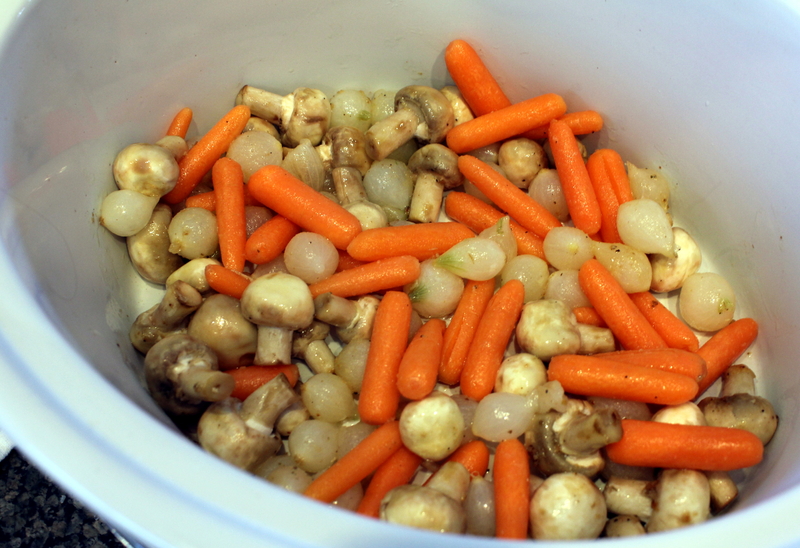 Transfer the mixture to the slow cooker, add the baby carrots, then return skillet to heat. Deglaze the pan with the wine and chicken broth, scraping up all the yummy brown bits. Whisk in the tomato paste, garlic, thyme, oregano, and bay leaves. Cook and stir for about 5 more minutes and turn off heat. 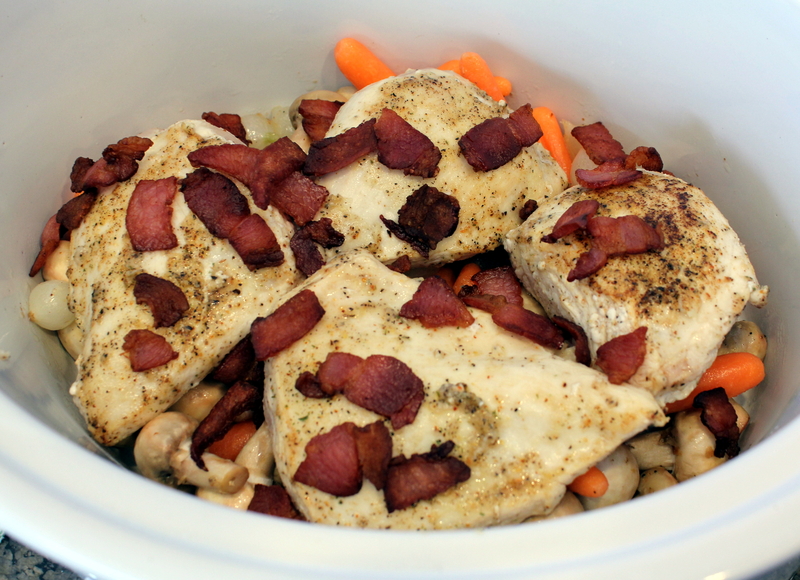 Place the chicken over the vegetables in the crock pot, add the bacon on top, then pour the wine mixture over all. Cover and cook on high for 3 to 4 hours, or low 6 to 8 hours. Make your mashed potatoes in the last half hour or so of cooking and keep over low heat until ready to serve. Spoon mashed potatoes into bowls, top with the chicken and vegetables plus juices, and sprinkle with fresh chopped parsley. Have lots of thick-sliced French bread for sopping up all the savory juices. Enjoy! Oh and I almost forgot. The wonderful organization that brought Caroline and my family together are now looking for more hosting families for this spring. Please, if you have any doubt about how wonderful an experience hosting is, go to the Andeo website and learn how you can sign up to host a student. You will not regret the experience! Here is a link to their website: www.andeo.org.